Making time for a side project is an ambition lots of creatives strive for. After all, design is a broad discipline with plenty of different skill sets working together and overlapping, so it makes sense to want to master everything – and passion projects are a great way to do that. However, it’s the ‘making time’ part that most people struggle with. To show you why creative side projects are worth the hard work, and how they can improve your life, we talked to leading creatives who’ve turned their side projects into careers. One of the best things about a side project is that it gives you the chance to explore a topic or technique without the pressure you'd feel if it was your day job, or if you knew it was going to be graded. This feeling of freedom and playfulness is probably what attracted a lot of people to a creative career in the first place, so side projects are a valuable reminder that the design industry is a great place to be, all things considered. At the very least they’re a good way of giving your brain some exercise. They can also come in handy in ways that aren’t immediately obvious. “It’s better to be seen as a generalist in all creative fields,” says Peter Bil’ak, speaking at TYPO Berlin 2017 during his ‘The Best Thing About Design’ talk. If anyone knows about the benefits of a side project, it’s Bil’ak. With a career that's seen him starting the type foundry and design studio Typotheque, teaching typeface design at the Royal Academy of Arts in the Hague, as well as editing the magazine of unexpected creativity, Works That Work, Bil’ak is walking proof that a diverse set of skills can take designers in surprising directions. One project that sums up Bil’ak’s outlook and work ethic is the decorative cement floor tiles he created after speaking at the Es Baluard Museum of Modern and Contemporary Art in Mallorca, where he was inspired by traditional Mediterranean architecture. As he says on the Typotheque blog, this project was an example of design at its best, in that it “addresses a very specific need, something both straightforward and personal.” And where better to explore a personal design connection than with a side project? This project also ties into Bil’ak’s belief that good design isn’t necessarily the one that generates the most money. In fact, by taking away commercial pressures, side projects give creatives a rare opportunity to design for fun again and come up with original ideas they wouldn’t have thought of otherwise. There are also other benefits to this way of working. “My work consists of mainly self-initiated projects, so I have a great advantage that I don’t have to attend any meetings,” Bil’ak tells Creative Bloq. While he admits these are specific pieces of advice that might not apply to everyone, Bil’ak does offer another insight that’s sure to help anyone struggling to make time for personal projects. As well as filtering out distractions, it’s also useful to keep in mind that side projects are something you need to keep plugging away at over a long period of time, if you want to get the most out of them. For illustrator and rapper Mr Bingo – whose illustration ‘The Problem With Life’ sums up the struggle creatives wrestle with all the time – focusing on a side project meant he could leave behind working as a commercial illustrator, and dedicate his time to being, in his words, “some sort of artist”. The building pressure to pursue a side project is a feeling lots of creatives can relate to. For Mr Bingo, this urge boiled over one drunken night when he decided to send a vintage postcard from his personal collection to a lucky Twitter follower. The popularity of this impulsive experiment eventually evolved into Hate Mail, a phenomenally successful Kickstarter-funded book that collected together 156 hateful postcards that Mr Bingo had sent out to eager recipients. Combining his passion with his creative skills made Mr Bingo’s Hate Mail a success, but sometimes there can be a nagging doubt that a project just isn’t coming together as naturally as you would like. If you’re questioning the drive of your work, Mr Bingo has some no-nonsense words of wisdom. Impulsive behaviour can be the tipping point that turns a side project into something much bigger. And while Mr Bingo’s Hate Mail project might have taken some Dutch courage to get off the ground, other creatives have embarked on more drastic moves that took a lot more planning. “In 2014, my boyfriend and I quit our jobs, sold most of our belongings and went on a trip around the world,” says designer, illustrator and visual thinker Eva-Lotta Lamm. “Travelling and taking time to experience the world around us is usually a ‘side project’. Work takes most of our time, so we made it our main project for 14 months." Drawing sketchnotes had been Lamm’s ‘side thing’ for roughly eight years. 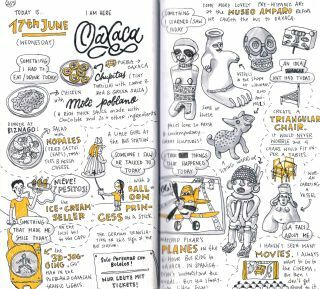 These visual notes were often jotted down at talks and conferences for her own benefit, but they soon started to find a life of their own after she shared them on Flickr. Even if the meandering trajectory of a side project doesn’t change your career completely, Lamm is keen to point out that this is part of their charm. After all, you’ll never know where they’ll take you if you don’t try them out.